The investigation of soil response to dynamic loads is necessary to predict site-specific seismic hazard. 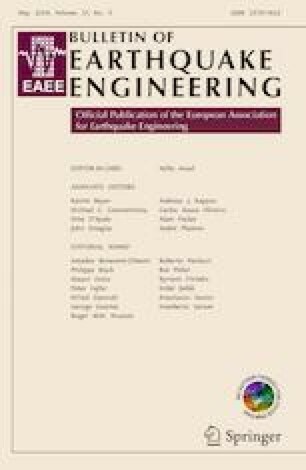 This paper presents the results of cyclic and dynamic laboratory tests carried out after the 2016–2017 Central Italy Earthquake sequence, within the framework of the seismic microzonation studies of the most damaged municipalities in the area. The database consists of 79 samples investigated by means of dynamic resonant column tests, cyclic torsional shear tests or cyclic direct simple shear tests. Results are firstly analysed in terms of field and laboratory values of small-strain shear wave velocity, highlighting the influence of the sample disturbance and of the mean effective consolidation pressure. The cyclic threshold shear strains as a function of plasticity index are then compared with findings from the published literature and the outliers are analysed. Subsequently, the dynamic soil behaviour is investigated with reference to the small-strain damping ratio. Differences between results from different tests are analysed in the light of the loading frequencies. Finally, the database is used to develop a predictive model for soil nonlinear curves according to plasticity index, mean effective confining stress, and loading frequency. The model represents a useful tool to predict the nonlinear stress–strain behaviour of Central Italy soils, necessary to perform site-specific ground response analyses. Communicated by S.I. : Seismic Microzonation of Central Italy. The project was carried out with the funding from Italian Government within the Level 3 Seismic Microzonation of 138 municipalities severely shaken by the Central Italy earthquakes. This funding is gratefully acknowledged. The Seismic Microzonation Center (“Centro per la Microzonazione Sismica e le sue Applicazioni”), entrusted with the task of providing scientific support and coordination of the activities, is also gratefully acknowledged. The Authors want to thank all the people who contributed in the execution of the laboratory tests: Silvano Silvani and Marco Bonaventura (Sapienza Università di Roma), Oronzo Pallara, Giovanni Bianchi, Viviana Chetry and Irene Coppetta (Politecnico di Torino), Antonio Cammarota and Alfredo Ponzo (Università di Napoli Federico II), Valeria Bandini and Giuseppe Di Filippo (Università di Messina), Eusebio Castellano and Francesco Contino (Università Kore di Enna).